Before its ratification, much of the opposition to the U.S. Constitution related to the fear of giving too much authority to the federal government. Such fear was based largely on the high-handed policies of the English king and Parliament prior to the American Revolution. The Constitution was thus a compromise document, with the 13 states surrendering many of their powers to the federal government while retaining others. In 1793 North Carolinian James Iredell delivered an important dissenting opinion in the U.S. Supreme Court on the state rights view of the Constitution. When a majority of the Court ruled that an individual could sue a state in federal court, Iredell insisted that the Constitution did not grant that power to the national government, and he reiterated the view of the Constitution as a compact between sovereign states. This view was confirmed in the Eleventh Amendment. From the 1790s until the end of the Civil War, there was almost incessant conflict over the issue of state rights, with states and regions on one side and the U.S. government on the other. Southerners were concerned about northern disregard for the rights of the southern states to manage their internal affairs, especially where those affairs concerned the ownership of slaves. Secession, which led to the Civil War, was the most severe test of the state rights doctrine. After the conflict, the principle of state rights was invoked in an effort to abolish civil rights for blacks and other minority groups, and to prevent the passage of child labor and antilynching laws. After World War II the federal government's ability to control subsidies to the states, as well as its regulation of interstate commerce, effectively nullified most assertions of state rights. The federal subsidy program extended its influence into many areas that were formerly considered the prerogative of the states. 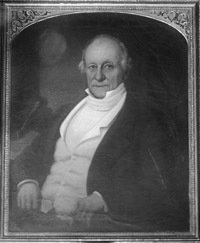 "James Iredell, Jr." Photograph no. 53.15.532. From the Audio Visual and Iconographics Collection, Division of Archives and History Photograph Collection, North Carolina State Archives, Raleigh, NC, USA.